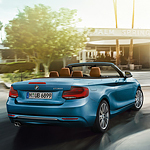 The BMW 2 Series uses a strut system to support the chassis above the front tires and a multi-link suspension system for support over the rear wheels. Since the BMW 2 Series of vehicles have rear-wheel drive, this arrangement where the strut supports the extra weight of the engine and cushions the steering system is up front and the multi-link system in the rear holds the power wheels to the road for greater traction makes sense. The certified technicians at Germain BMW of Naples check your suspension system every time you bring the BMW 2 Series in for service.